The outdoor dog kennel is a must-have accessory for animals that live outside. 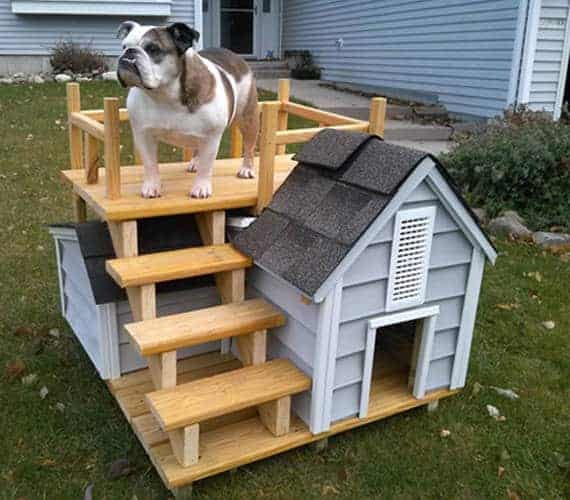 And there are doghouses for all tastes: 100% wood, plastic weather resistant, large format, aesthetic, transportable ... and even doghouses for an indoor dog. Outdoor Dog kennel: at what age? How to choose an outdoor dog kennel for his dog? Where to install the outdoor dog kennel and how to arrange it? In the doghouse even in the winter? In the first few months, the puppy cuts everything that falls under his teeth. So be sure to install a small, well-planned wooden box with a hard cushion covered with a washable envelope. Under the cushion you can bury an old awakening; His regular tic-tac will keep company with your boyfriend. Once the critical period has passed, replace this Spartan accommodation with a much more elegant wicker basket or synthetic fabric, which you will buy at any animal warehouse. If you have a small dog, choose a transportable basket (or travel bag), very convenient when traveling or on holiday, when you go to the hotel. So wherever you go, your dog will always feel at home. If you have a big dog, install a rigid mattress that you can make to him or her. In all cases, your friend's diaper will be easy to maintain and installed in a place free from drafts and valuable furniture. 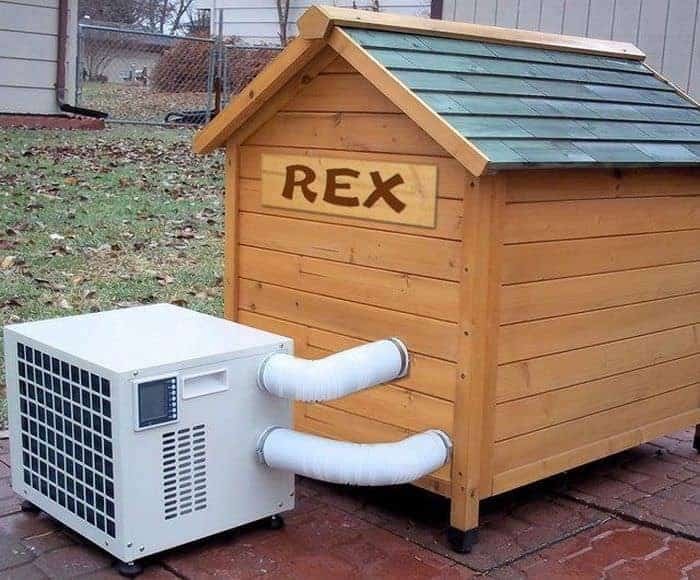 If you do not want to keep your dog at home, build an outdoor dog kennel that is protected from the wind in the cold season and from the sun in summer, and away from the street to prevent it from barking passers-by. If the park is not very large, the soil will be slightly sloped and cemented, if it is large, cover it, especially with sand. The fence will consist of a wire net high enough to defeat fugue attempts. 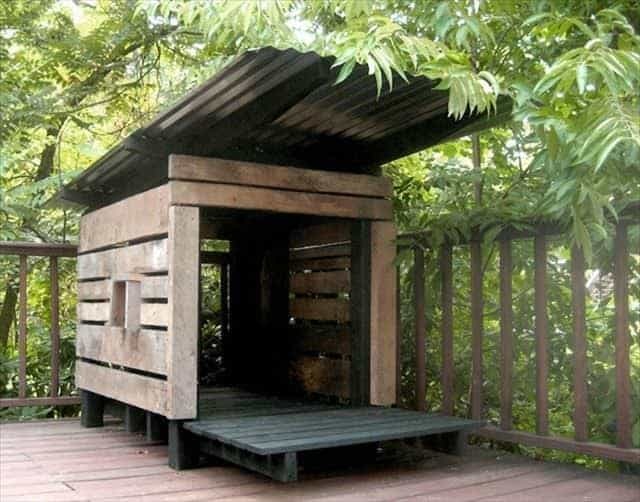 The outdoor dog kennel, made of solid wood (never cemented), should never be too spacious: your dog must be able to warm it with the heat of his body. The bottom and the walls will have two thicknesses of wood separated by a thickness of an insulating material. A raised roof makes it easy to control the interior of the kennel and to facilitate cleaning. The dog kennel must be adapted to the size of the animal. If one thinks of doing well by taking the biggest model possible, this is actually not a good idea. It should not be too narrow so that the dog can lie down and turn around. But it must not be too big, even if there are large format doghouses, to avoid loss of heat and therefore the animal is cold. It is because of its body heat that the dog will maintain in its outdoor dog kennel an ideal temperature. It should not be too small: your dog should be able to turn around. It should not be too big either. It is the body heat of your doggie that heats a kennel. If it is too large, it will not heat it properly. Probably the most classic, the wooden dog crate can be installed outdoors and generally offers good insulation. Wood limits heat fluctuations and its strength allow the kennel to last many years. If you want to decorate your dog's house by painting it, for example, consider choosing non-toxic products that your pet may ingest while nibbling. Weatherproof solid wood construction with slanted roof to ensure good drainage, the fashionable design for your love dog. Wooden kennel's surface with waterproof paint and durable for both indoor and outdoor use. There are PVC kennels. The advantage is that they are easier to clean. But they do not have the same insulating properties as wood. If you live in an area where winters are harsh, your dog may be cold. In summer, these doghouses can become unbearable as they are hot. In areas with a very humid climate, the treated metal kennel is recommended. It also has the advantage of being easier to maintain than the wooden one. While sloping roofs are still the most widespread, flat roofs are a success because they are often removable and therefore facilitate the cleaning of the kennel. What's more, dog and cat will be happy to take a nap! You can choose between sloping roofs or flat roofs. These are removable and therefore facilitate cleaning. They are very much appreciated by dogs, who can lie down on them. To keep the heat from the doghouse, in the winter you can add a door. Choose a swing door that your dog can easily open from outside and inside. There are also transparent doors that allow your doggie to see what's going on outside. Ideally, it is best to choose a kennel with feet for it to be well insulated from the ground. If the one you buy does not have one, it is always possible to raise it with bricks or a palette. A puppy can not sleep outside in a kennel. He is not able to warm himself. A dog can go into a dog house from 6 months. Some breeds are not predisposed to sleep outdoors like pet dogs while others adapt easily. A kennel must be cleaned regularly. With each cleaning, treat it with a spray anti-parasite. 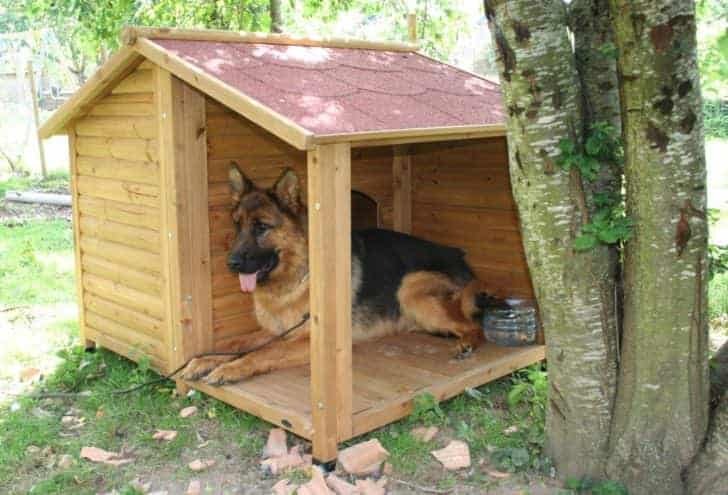 A kennel should be a comfortable place for your doggie. You can add a carpet or straw to make it feel good. In winter, a kennel must be sheltered from the wind, facing south so that the sun warms it during the day. In summer, prefer shaded places. A kennel is a place where your dog rests. Avoid placing it in a corner too noisy like the proximity of a street. If your dog is a watchdog, he must be able to observe all your terrain. To treat or paint a kennel, always use non-toxic products for your doggie. 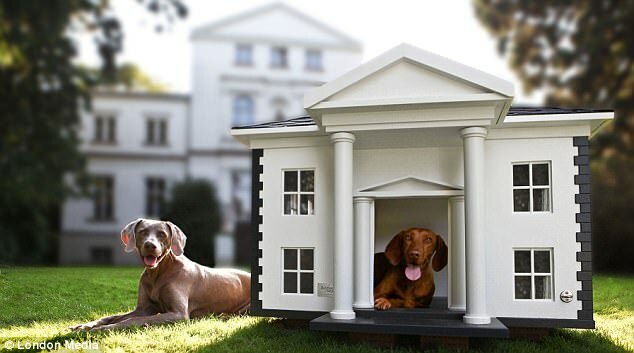 If you decide to build yourself the house of your pet, consider isolating it. If your dog sleeps in his kennel both summer and winter, consider isolating it from the ground by resting it on four bricks or cinder blocks if it has no feet. It will thus be preserved from parasites and humidity. The installation of a door will also be necessary. Prefer a swing, which opens inwards and outwards. In summer, install the kennel well in the shade and sheltered from the heat. In winter, choose a place well sheltered from the wind. All the walls of the crate must be covered with an effective insulation. But in the event of extreme cold, that will not be enough. If you do not want your dog to enter the house, install the doghouse in the garage if it is warm enough. Insulation mat, cozy mattress, pillows, toys or comforters: do not hesitate to decorate your dog's kennel with some accessories to make it a haven of peace and comfort where he will like to come to take refuge and rest. In winter, provide the entrance of the kennel with a small swing door opening both inwards and outwards. You can also build a very nice summer pet house from an old barrel. In all cases, the outdoor dog kennel must be isolated from the ground and placed on four bricks. But when the cold really starts to feel, it will be necessary to return the dog inside so that it does not suffer from bad weather. If you do not want it to go into living rooms, you can put it in the garage if the temperature is acceptable. Clean the kennel frequently and disinfect it from any parasites and their eggs. Wash with detergent and water spray and rinse with water in which you have diluted pest control products (use twice the usual dose for hair disinfection).